This is the third and final article in a series that places the Justice for Our Stolen Children camp in Regina into historical contexts of tipi camps and settler responses to Indigenous presence on the prairies. The previous two articles can be found (here) and (here). As the previous essays in this series have established, Indigenous people in tipis on public lands is nothing new. Nor is it a new phenomenon when settlers seek to have Indigenous presence or absence conform to our own short-term goals. The Justice for Our Stolen Children camp was set up as a way for participants to claim agency and representation in important contemporary issues, but these issues hold deep historical roots. The final report of the Truth and Reconciliation Commission in 2015 called on settlers to help foster reconciliation and address these past and present wrongs. But as we are reminded by requests to display tipis at celebratory events, these well-intentioned efforts at inclusion do not automatically fulfill goals of reconciliation. As political scientist Rita Dhamoon has argued, multiculturalism, as a Canadian value, has in fact served to regulate non-white society, because it ignores questions of power and racism. Without the historical contexts for tipi camps, the tipis remain the same ahistorical symbol of nationhood they were expected to be during invited events like Pion-Era, or more recent Canada Day celebrations. A deeper understanding of Indigenous experiences of tipi camps reveals that settler and Indigenous goals for these spaces have often been different, yet the public narrative has been driven largely by settler interests and understandings. Indigenous comedian Ryan McMahon has emphasized that decolonization is ultimately about land. The tipi encampments at the Saskatchewan legislature reinforce that idea on both micro and macro levels. As a microcosm of settler-Indigenous relations, they show how, when Indigenous people are in the public eye, public commentary reflects ideas of settler entitlement to Indigenous space and how it is used. Comments on the Justice for Our Stolen Children camp’s Facebook page, while of course not a comprehensive survey of public opinion, do suggest that disputes about the camp are often not centred on the ideas that participants advocate. Instead, they revolve around the use of the land itself, with some commenters stating that they did not feel safe in Wascana Park with the camp there, and others arguing that the protesters were not legitimate because they did not follow the municipal law against overnight camping. This microcosm of Indigenous-settler relationships on the land has its roots in the early days of settler colonialism on the prairies. The tipis today remind us of the imagery used on treaty medals given to First Nations leaders at the signing of the Numbered Treaties. 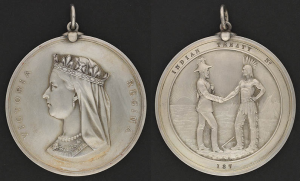 On one hand, the treaty medals, and the treaties themselves, were an acknowledgement of Indigenous presence on the lands into which settlers were beginning to move. Yet situated in the background of the treaty medallion, the tipis also fade into the background, as Indigenous people were expected to do as well. This contradiction continues today in the responses to the Justice for Our Stolen Children camp. The discussions of decolonization in this series have grown out of our readings of Saskatchewan histories in the context of tipi encampments. But more specifically, our analysis has been informed by our many conversations with Indigenous individuals and organizations over the years. When asking Indigenous people about the history of their families, communities, meaningful places, or even simply their favourite activities, it is rare that these conversations with us have not started with our conversation partner giving an overview of the role of colonialism in these histories. It is clear, from these many conversations across many different contexts, that when speaking with settlers, Indigenous people do not assume that settlers know about the depth and breadth of colonial violence. Indeed, even if settlers learn about the lingering tendrils of colonialism that shape our society (and do so profoundly and violently for Indigenous people), without also learning about the complexities of Indigenous cultures and perspectives, we risk creating definitions of reconciliation that continue to be centred around settler interests. What, then, can settlers do with the knowledge that Indigenous visibility in Canada has long been portrayed as simultaneously threatening, yet has also been used as a symbol of the nation whose history is closely entwined with Indigenous subjugation? Maori scholar Linda Tuhiwai Smith has commented that reconciliation does not simply mean healing or forgiveness; it means recognizing that although colonialism does, of course, disproportionately harm Indigenous people, it also creates societal structures that hem us all into continued harmful patterns of action. In fact, in a conversation at the University of Victoria, scholars of decolonization Corey Snelgrove, Rita Dhamoon, and Jeff Corntassel noted that paradoxically, the solidarity or allyship of non-Indigenous peoples with Indigenous concerns can create or reinforce hegemonies. 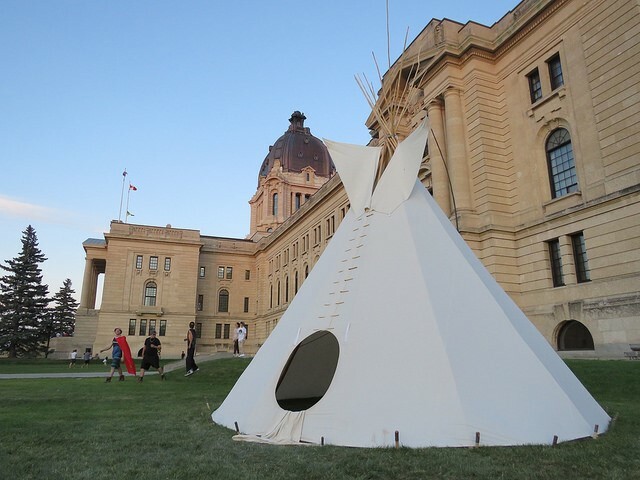 Today, tipi camps continue to be an invited attraction; organizers of Canada Day festivities in Saskatoon ask members of the Whitecap Dakota First Nation to bring tipis to display at the event. Tipi camps at festivals from Pion-Era to present-day Canada Day events remind us that even well-intentioned inclusion of Indigenous people (or at least Indigenous presence) can continue to reinforce long histories in which settlers have sought to drive the narrative about Indigenous people’s experiences. Hearing Indigenous people’s needs and expectations about those same events helps to show where gaps in understanding occur, and show us where our own assumptions have silenced Indigenous perspectives even at the same time that we invite their presence. The Justice for Our Stolen Children camp responded to a September court ruling instructing them to remove the camp from the legislature grounds. As this article is being written, the sacred fire that has been burning at the camp since February is no longer being stoked, and the tipis have been dismantled. This Indigenous presence on the legislature grounds may have gone away, but as histories of tipi encampments show us, a lack of Indigenous visibility does not mean that settlers are absolved of hearing diverse Indigenous voices. Rita Dhamoon, Identity/Difference Politics: How Difference Is Produced, and Why It Matters (Vancouver: UBC Press, 2009), xi. “Ryan McMahon’s 12-step guide to decolonization: why land matters,” CBC online, June 16, 2017, https://www.cbc.ca/radio/day6/episode-342-shaming-advertisers-midnight-sun-baseball-rebirth-of-the-concorde-ear-hustle-and-more-1.4161820/ryan-mcmahon-s-12-step-guide-to-decolonization-why-land-matters-1.4161856. For instance, barely a decade after First Nations leaders agreed to Treaty 4 provisions that they understood would protect their way of life in what is now the Regina area, John A. Macdonald stated of Indigenous people on the prairies: “we have been pampering and coaxing the Indians; that we must take a new course, we must vindicate the position of the white man, we must teach the Indians what law is…” Canada. Parliament. House of Commons. Debates of the House of Commons. 5th Parliament, 3rd Session (June 6, 1885-July 20, 1885). Ottawa: Maclean, Roger & Co., 1885. Pages 3110-3119. See Linda Tuhiwai Smith, Decolonizing Methodologies: Research and Indigenous Peoples (Dunedin: University of Otago Press, 1999). Corey Snelgrove, Rita Kaur Dhamoon, and Jeff Corntassel, “Unsettling Settler Colonialism: The Discourse and Politics of Settlers, and Solidarity with Indigenous Nations,” Decolonization: Indigeneity, Education and Society 3, no. 2 (2014): 6.